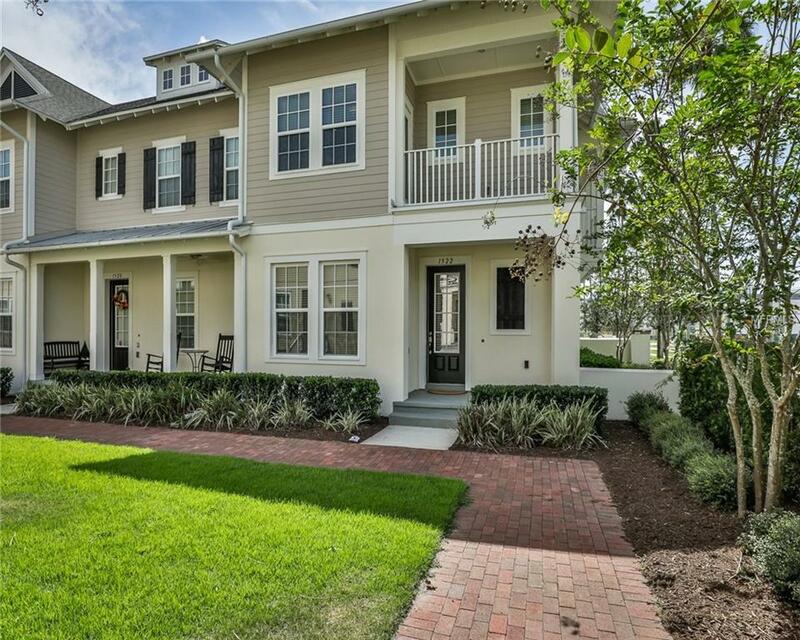 LIKE NEW CORNER TOWNHOUSE IN CELEBRATION'S SPRING LAKE NEIGHBORHOOD. Light and bright with lots of windows, this Dinsdale floor plan has two bedrooms, 2.5 bathrooms, a den and very spacious loft. YOU GET A LARGE FENCED SIDE YARD -- room for a grill, outdoor furniture and a play set. WATCH THE NIGHTLY DISNEY FIREWORKS FROM YOUR MASTER BEDROOM BALCONY OR THE BALCONY OFF THE LOFT! As you enter the home, the open floor plan with 10 foot ceilings is enhanced by the warmth of the hickory scraped wood floors and neutral colors. Kitchen has New Caledonia granite counter tops, light wood cabinetry, an island with room for seating, a mosaic tile back splash, stainless appliances and a designer hood. Built-in work space off of the kitchen. The two-car garage is attached, which is so convenient. Upstairs is carpeted and you'll find the laundry room, loft and a split floor plan for the bedrooms. Your master retreat has an expansive walk-in closet, balcony, double sinks, deep tub and separate shower. Exterior maintenance, roof, landscaping and irrigation are worry free: let the HOA take care of these for you. HOME IS IMMACULATE! Furnishings are negotiable.